Google Tips is a website launched two years ago by Google to help Google users develop a working understanding of how Google products operate. As its name suggests, this platform provides a wide variety of tips and tricks geared towards enhancing users knowledge of different services including: Chrome, Google+, Google maps, Google Drive, Gmail, YouTube and Google Search. 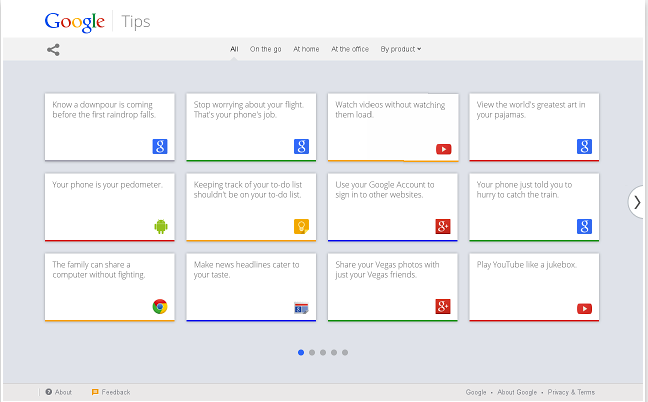 Now the Chrome extension of Google Tips is available for free download in Chrome web store. Google Tips Chrome extension "shows you the latest and greatest tips and tricks across your favorite Google products like Maps, Search and YouTube. For instance, did you know you can ask Maps to give you directions to your family or friend’s place, without having to type in their addresses every time? You can even browse tips by things you can do on the go, at home, at the office- or by product. Click any card that catches your eye and flip it over to find out more. "